Mit dem four²widget ist Bahn87.de erstmals mit einer App im Ovi Store vertreten. Das Widget ist ein einfach zu benutzender Foursquare-Client für foursquare.com. Du kannst sehen, wo deine Freunde sind, eine Nachricht an sie senden, mit GPS nach Treffpunkten in deiner Umgebung suchen oder sogar neue Treffpunkte und Freundschaften hinzufügen. Auch eine Kartenansicht ist dabei. foursquare ist schon lange ein Renner auf iPhone, Android, Blackberry und WebOS, mit four²widget ist der Location Based Service fürs Geotagging jetzt endlich auch auf Nokia-Handys mit Symbian nutzbar. Die Version für Touchscreen-Geräte und eine Testversion sind voraussichtlich ab Juli im Ovi Store verfügbar, die Version für Geräte ohne Touchscreen befindet sich in der Entwicklung. Zur Nutzung der App wird ein kostenloser Account von foursquare.com benötigt. Es können Datentransferkosten entstehen. Downloaded your app, but it wont let me login. Says authorisation failed every time! help? Sorry, you seem to be the only one having that problems so far. I hope it's OK for you to try to solve that problem using mail. Just downloaded the Four^2 app. And put the email and password of my 4sq but the app does not make the auto connect throught the mobile net. The 'connecting' message remains long. Any tips? Hi! I really want to try your application and write a review for my blog site, but it's not available on Ovi Store... Why? Four²widget and a free trial will be back to Ovi store next week! Wann kann man mit einer Version für non-Touch rechnen? Warte schon lange auf ein Tool für Symbian und das was man sehen kann sieht sehr schön aus. Zumal die Demo derzeit auch nicht im OVI-Store ist, schade. Ob es eine Version vor Non-Touch geben wird, ist derzeit fraglich, da es Probleme beim Ansprechen des GPS gibt. Dass die Demo derzeit (wie auch die Vollversion) nicht im Ovi-Store ist, finde ich auch sehr schade. Es liegt aber nicht an mir, ich habe die aktuellen Versionen vor ca. 2 Wochen an Ovi gesendet aber sie wurden noch nicht veröffentlicht. Hallo, ich verwende das Widget auf meinem 5230, funktioniert super. Ich würde mir nur wünschen, das man auch nach Facebook publishen kann, so wie im Original auch. Ist das angedacht? Das war bisher nicht angedacht, sollte aber machbar sein. Ich werde mich bei Gelegenheit darum kümmern, das kann aber noch ein bisschen dauern. Mittlerweile ist die Version für 3rd Edition Geräte ab WRT 1.1 übrigens hochgeladen und sollte bald zur Verfügung stehen. Hey, danke für die rasche Antwort! Dear Rudolf! I'm trying to log into Foursquare through your trial widget I downloaded from Ovi Store. It only says "Connecting". So it seems that I can't log in. Is it a bug or something I could take care of? Thanks in advance! I'm sorry, I meant to address Benjamin (the developer) in my last post. This is a known issue that occrues on some peoples phones and nobody knows why. For this reason, I provide a free trial. Benjamin: It seems that the phone (Nokia 5800 XM) never tries to connect to the 3G or WLAN. I'm not the Symbian-programmer but the key lays maybe there, that your app never activates the connection. Hi Alexander, I don't think that this is the problem, because the widget works without any problem on many 5800's. I think I'm not able to fix it. Kann leider im OVI Store nicht bezahlen, 3 verschiedene Kreditkarten, alle gültig, bringen die gleiche Fehlermeldung. Support meldet sich auch nicht. Bitte Bezahlung per Telefonrechnung ermöglichen! Hi, I have another problem. I've installed app (on Nokia 5800 XM) and I can't find shortcut - I have go to Ovi store app -> My stuff -> Four²Widget and then lounch the app. Where is he problem? Can you help me? Don't knwo what's the problem on your phone. Maybe it helps to reinstall the widget or to reset the phone memory (backup your data first). Hallo, habe das widget bezahlt und runter geladen, komme aber nicht weiter, weil Benutzername und Passwort immer falsch sind. Was muss ich denn da eingeben? Hi Duncan, you can try to launch Ovi Maps first and wait until GPS connection is stable before starting Four^2widget. The trial version has huge limittions, you can only display few information to test if the widget will work on your phone. Nochmal: Hallo, habe das widget bezahlt und runter geladen, komme aber nicht weiter, weil Benutzername und Passwort immer falsch sind. Was muss ich denn da eingeben? 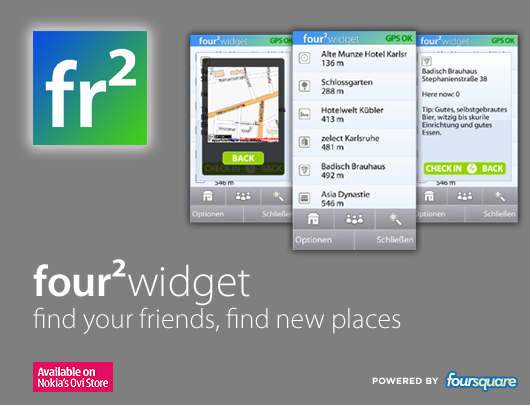 I have downloaded the Four^2 widget, but I am not able to log on to Foursquare with it. I receive the same message as the user "Dan" at juni 10th. I have checked that the password is correct by logging on to the Foursquare website with my PC. Can you provide any tips? I can confirm that there are problems on some phones. Four²widget is free now and not longer under development. Unfortunately, does not work for me. Phone is Nokia X6-00. It seems a problem with authorization, displays GPS OK only if run Google Maps first. None of 3 tabs are working. As far as I understood, this widget will not be updated yet? Hi Janur, I'm sorry but there won't be any further updates on four²widget. If it doesn't work for you, you might try another foursquare app for your phone. Hi Benjamin. Thanks for your reply. I used to install the Sym4square app, it is ok. I loved your widget very much - lightweight, with clear interface. I'm really sad of this situation. Very much appreciate all your efforts. Thank you and let me wish you great luck!